Beginners – let’s get you up and running as a quilter! This class is for beginners to patchwork and quilting. You start with the BASICS to get you comfortable with the techniques and knowledge of both traditional and modern quilting. 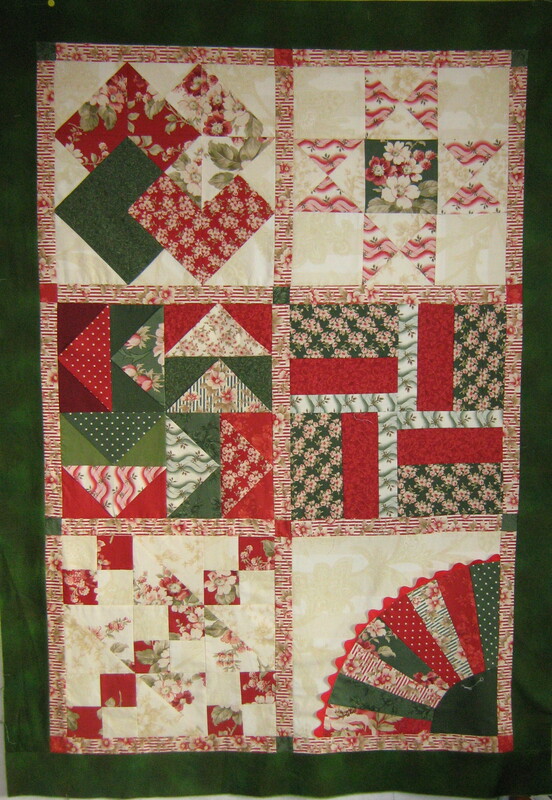 You will learn how to cut, press and sew your patchwork, using your machine to create a Sampler Quilt – where each of the six blocks will develop another technique. You provide your fabric and I’ll take you into the joy of quilting! The course addresses all 3 styles of quilting – traditional, modern and contemporary, but we can’t do everything at once. First the basics need to be learned – which are fundamentally the same, regardless of the kind of quilting you want to do. This late spring class will therefore concentrate on basic techniques of quilting – measuring, cutting, piecing, pressing, pinning, working with colour, threads, needles, sewing machines and so on. The student will be producing simple and then more difficult blocks both traditional and modern, in order to learn techniques and then ultimately by the end of class, the student will have made a 6 block quilt in the traditional manner or with a hint of modernism if the student so wishes. The blocks that you will learn are: nine patch; rail fence; flying geese; Ohio Star; Card Trick; and Granny’s fan. The classes will be dynamic and where a student doesn’t complete within the hours, homework will need to be completed prior to the next class. Students should have ande use their own sewing machine in class. Students will need to chose the fabric they wish to use to suit the kind of quilt they wish to make. Places are limited for the workshop. While this is essentially a beginner’s workshop, those with prior knowledge are welcome to attend since one can always learn something new and it works very well as a refresher. The first 6/7 lessons the students will be given a block to make in their preferred colours. The last weeks, the quilt will be sashed, bordered and sandwiched and then quilted to a minimal level. Two quilts made in this course are above. The emphasis during this course is on the learning of the techniques rather than on the end project. Whether you choose to make a small sampler quilt, a series of cushions using the blocks, or merely to keep your blocks as a reference is entirely your choice. Introduction: The course’s goal is to teach the relevant and necessary skills for you to begin your journey into quilt making. Using your sewing machine each session will take you through looking at new blocks, colour choices, different cutting techniques, and other aspects of the construction process, you will gain confidence and a love for this creative art form. 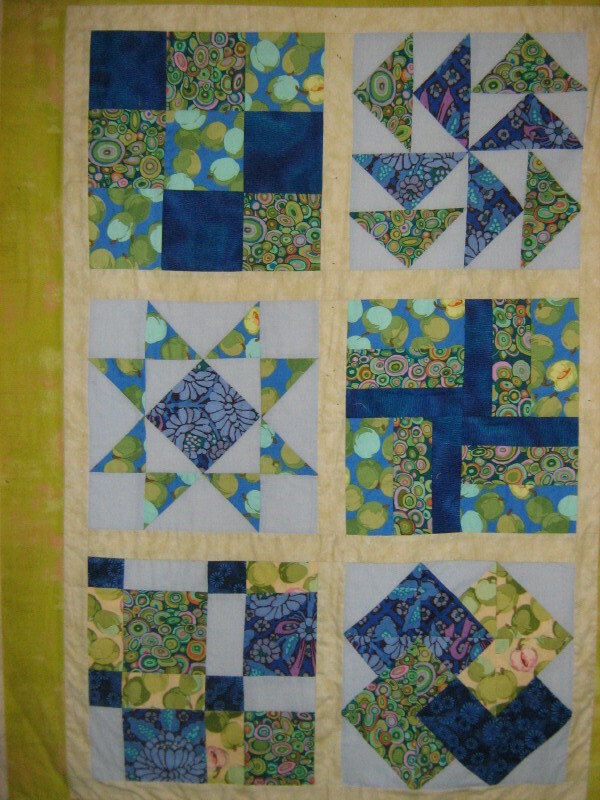 The Beginner’s Patchwork and Quilting Course is held over a period of 24 hours in nine x two and a half hour sessions. It may be necessary for course members to finish work at home rather than in the class, so that the group works together across the course. feel enthusiastic about pursuing further patchwork projects.